For two games in a row, Fnatic have not continued to disappoint us. But, up against PSG.LGD, we’re hesitant on whether the Southeast Asian powerhouse will be able to go for a third straight win. With that said, we’ll now turn our eyes onto the other lower-bracket matchup scheduled tomorrow, this time between EHOME and Evil Geniuses. A clash of contrasts, these two teams’ playstyles could not be any more different. Where Evil Geniuses are filled with individually skilled laners in each position who will play the entire map, ensuring that they farm every possible creep wave even if it means putting themselves at risk of getting picked off, EHOME are content on letting lanes push in or out if it guarantees them a secured kill as they rotate often as a five-man at the expense of their individual farms suffering. For the first five to ten minutes of the game, expect Evil Geniuses to win. They’re too good of a laning team to lose to anyone. But, EHOME’s strength doesn’t lie on winning lanes. In fact, they lose lanes more often than not. Rather, EHOME wins by suffocating their enemies and forcing them to think twice about venturing out alone as they continuously scour the map for kills. Of course, this often comes back to bite them, especially against top-tier teams. Both Virtus.Pro and Team Secret exposed the weakness of EHOME’s strategy earlier in the tournament. But this is Evil Geniuses we’re talking about. Though admittedly skilled, they don’t play off of each other the same way the two aforementioned teams do. 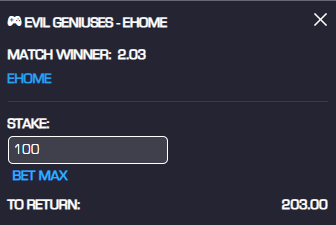 With that said, our money’s on EHOME to advance and move on to fight another match.